DAVOS, Switzerland -- Yesterday, Secretary of State John Kerry said in Davos that sanctions against Russia could be removed in a period of a few months. 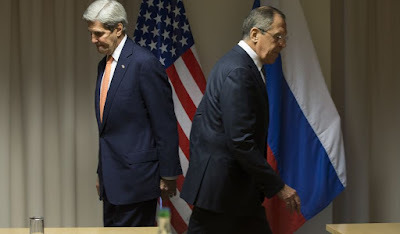 U.S. Secretary of State John Kerry (L), and Russian Foreign Minister Sergey Lavrov walk to their seats for a meeting about Syria, in Zurich, Switzerland, on Wednesday, Jan. 20, 2016, before Kerry was to attend the World Economic Forum in Davos. Kerry’s trip is expected to last nine days and to encompass stops in Switzerland, Saudi Arabia, Laos, Cambodia, and China. The diplomatic, public statements along with movement of Western diplomats on the ground, meeting with their Russian counterparts, suggest Moscow has chosen to trade East Ukraine for sanctions relief to save their plummeting economy. “I believe that with effort and with bona fide, legitimate intent to solve the problem on both sides, it is possible in these next months to … get to a place where sanctions can be appropriately … removed,” said Kerry during a speech at the World Economic Forum in Davos, Switzerland, reported CNN. This scenario most likely would not have happened without the price of crude oil collapsing on world markets to its lowest level since 2004, placing severe stress on Russia’s hydrocarbon dependent economy. It seems that the Kremlin has chosen to abandon the conflict in Donbass for its new offshore, military expedition in the Middle East. With Russian engineers on the Turkish, Syrian border, possible preparing to establish another new Russian air base under Turkey’s (and NATO’s) nose, Moscow most likely has decided that keeping Russia’s newfound influence and footprint in Syria, supporting the Assad regime and joining forces with Iran, is more important than continuing to fund and militarily support a lost cause in Donetsk. Most likely Moscow sees sanctions relief as a bigger prize. In actuality, the Kremlin can keep the pressure on Kiev to achieve its agenda with covert operations by its security services. Moscow can resupply the rebels in Donbass at will by just sending trucks across the border if it decides to in the future. Building military infrastructure to promote Russian power projection in Syria is a much more involved endeavor and one the Kremlin does not feel it can abandon at this stage of the operation. Russia’s long-term goals in the Middle East remain to be seen.